Dwight and Marquis Gilbert demo music-making in front of Jim Campbell's Taxi Ride to Sarah's Studio, 2010. LEDs, wire, custom electronics. Milwaukee Art Museum, Purchase, with funds from the Contemporary Art Society. © Jim Campbell. Photo by the author. Scratching, turntables, bass, melodies, rhythm. Not exactly vocabulary you’re used to hearing about in an art museum, is it? 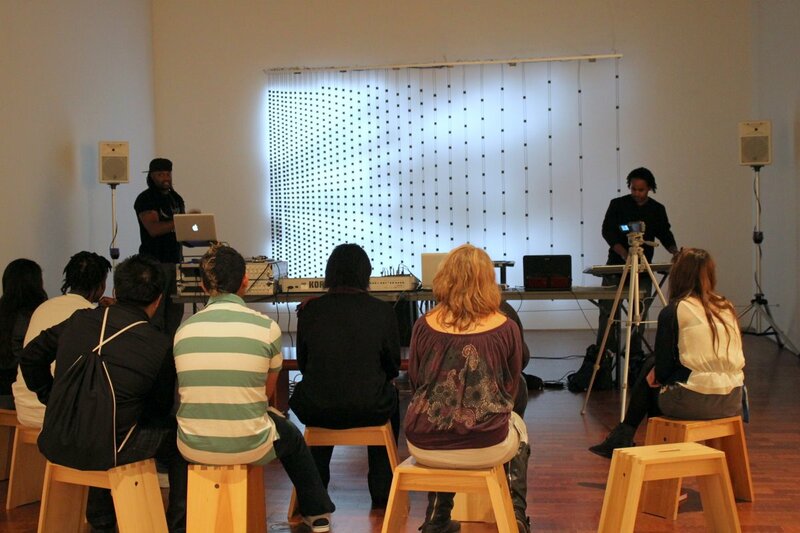 In an experiment with H2O Milwaukee Music/the Peace Propaganda Project, an urban music education organization, we put teens, music educators, and video art all together in a gallery to see what would happen. The mission: Create an original piece of music inspired by Jim Campbell’s Taxi Ride to Sarah’s Studio (2010). First, we took 15 minutes to look closely at the piece, which is made up of many small LED lights programmed to blink at certain intervals, creating an unusual video installation (see video below). Teens immediately centered in on one of Campbell’s primary interests: visually representing peripheral vision. 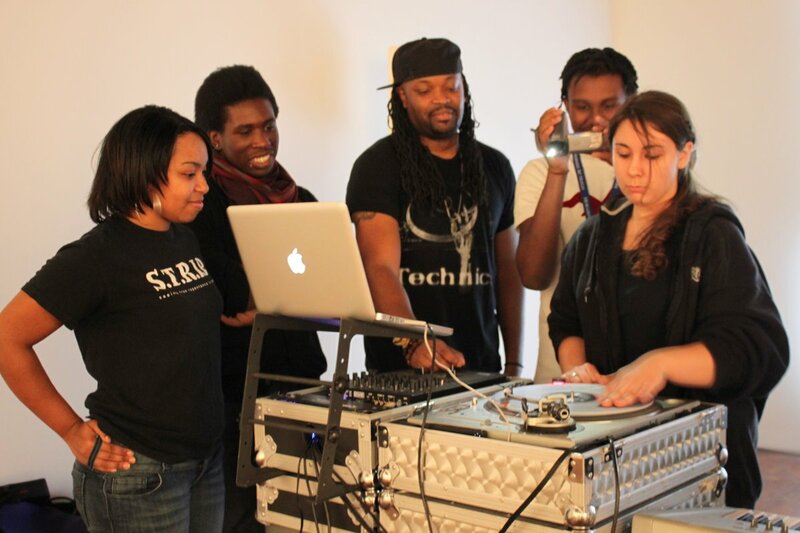 Then, with an array of equipment–turntables, laptops, keyboards, subwoofers, speakers–we set about creating a piece of music inspired by the look, mood, and rhythm of Campbell’s piece. The Satellite High School Program is an opportunity for teens to deeply engage with art history in the Milwaukee Art Museum galleries, develop their own personal interpretations of art, and learn about arts careers. I’ve also tried to highlight the many ways that visual art intersects with, inspires, and is inspired by other arts disciplines–fashion, dance, writing, and music, to name a few. When I heard about the Peace Propaganda Project, I knew they’d be the perfect partners to experiment with. Dwight and Marquis Gilbert, the founders of H2O Milwaukee Music, deftly led the teens in the endeavor–and I’ve never seen my students more excited! 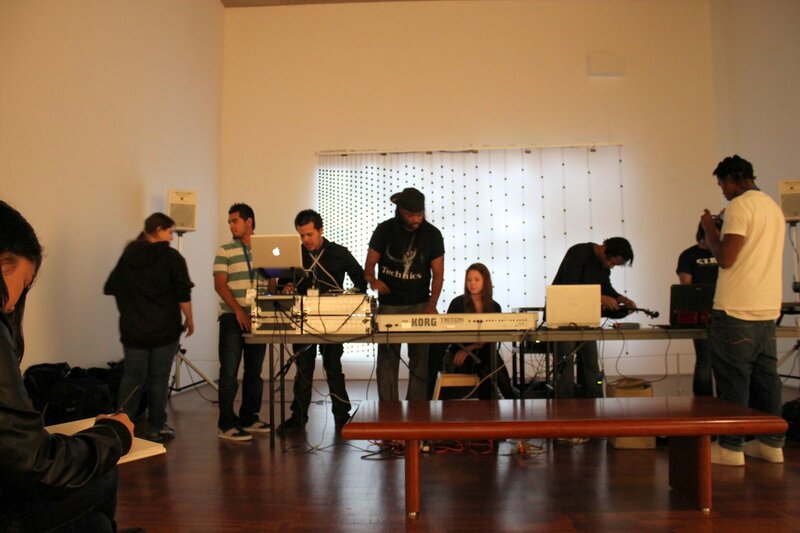 As they got hands-on with music equipment, the class took on an informal, project-based feel. 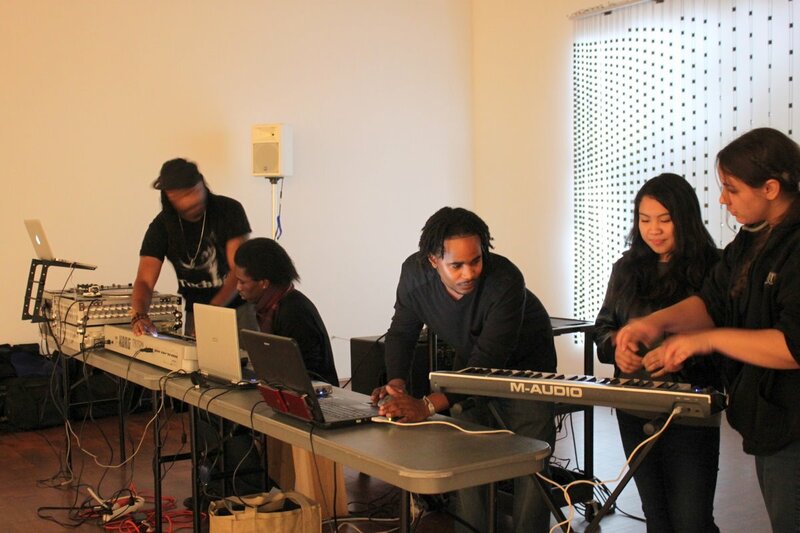 The galleries filled with laughter and conversation–not to mention beats and bass–as the teens stepped up to the keyboards to lay down layers on the track. 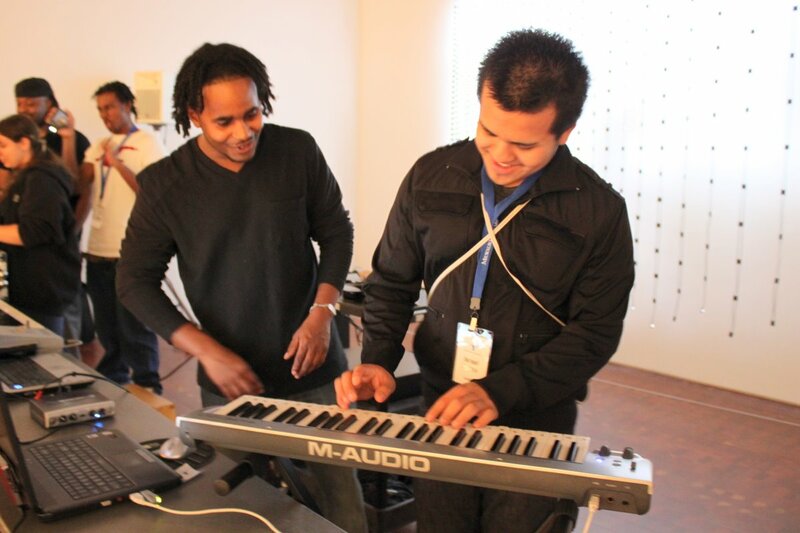 Dwight and Marquis encouraged the teens to think about the rhythm and sounds of the piece to inform the music they were creating. Since making music in this format almost seemed like a performance, some teens were uncomfortable giving it a try. (Not gonna lie: I was a bit intimidated by the keyboards and turntables myself.) I loved that Dwight and Marquis had a camera available for the teens to record the experience–so those who felt less comfortable making the music were able to stay involved and engaged by recording it for posterity. You can see the video at the bottom of this post and get a taste of our hour-long music-making extravaganza in the galleries. Thanks so much to Dwight and Marquis, as well as Kari Couture at MPS Partnership for the Arts for putting me in touch with them. And let us know what you think of the final tracks, which you can listen to here and here! The Milwaukee Art Museum High School Programs are supported by the Milwaukee Public Schools Partnership for the Arts and the Wisconsin Arts Board. This entry was posted in Education and tagged Behind the Scenes, Contemporary Art, Jim Campbell, Museum education, Music, Satellite High School Program, Teen Programs, Video art. Bookmark the permalink.